Would you like to learn Spanish or improve it? 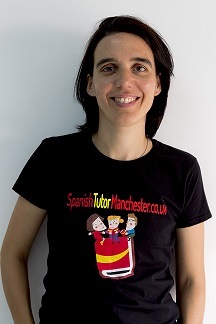 My name is Maria, I’m a native Spanish tutor from Valencia with experience as a Spanish language assistant at the Altrincham Grammar School for Boys (A level groups) as well as in the business sector helping employees to learn the language since 2009. I teach Spanish at all levels from beginners to advanced, at my home in Altrincham or aroud the Trafford area and all my Spanish tuition is personalized according to the needs and requirements of each student. “Always” at your own pace. With some students, for example, I may have to focus on particular aspects of Spanish grammar and vocabulary, while others may need extra help with their communication techniques like pronunciation or conversation. I can also help students prepare for GCSE, A-level (new program) or DELE exams. ONE TO ONE at my house in Altrincham £25 per hour. LESSONS AT YOUR HOME: £30 per hour. A LEVELS ORAL PRACTICE GROUPS: £15 per student. Get your classmates together and make a group of at least 3 students. Larger group will have discounts. To learn in groups is fun too! Customised lessons for your sector. One to one or small groups. For price details, please contact me by the contact form.